Driven by financial and operational pressures to add value, take advantage of cloud computing, improve security, and address concerns such as performance and availability, IT organizations frequently must evaluate the data center infrastructure for ways to meet goals that may seem mutually exclusive. In addition, as cloud computing and consumerization transform the traditional server (application) tiers into mobile, virtualized containers, applications and servers are abstracted from the infrastructure, severing their easy integration with the systems typically used to provide for availability, performance, and security. As a result of these trends, more organizations are recognizing a critical fourth tier within the data center architecture-a flexible and highly scalable tier in which application delivery concerns such as security, performance, and availability can be readily addressed. The application delivery tier is based on an Application Delivery Network, a set of services that address and mitigate the operational risks imperiling the successful deployment and delivery of applications. At the heart of the Application Delivery Network is the Application Delivery Controller (ADC). While most often associated with load balancing-a core technology used to address availability and performance issues-the modern ADC has evolved to provide services to mitigate security threats, ensure availability, and improve performance within the data center and into the cloud. 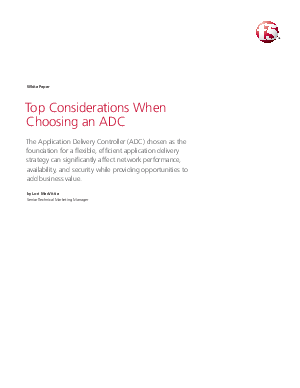 Because of its strategic location in the data center network, the selection of an ADC should involve careful consideration of both functional and financial factors. This paper explores the core functional considerations that ultimately have longer-lasting effects on the IT department's ability to design and deliver the infrastructure services required of applications today-and tomorrow.